From 19th April till 19th August 2018, The Artground presents Rolling @ TAG, a smart-interactive playspace designed by educator Aida Daiya (Japan). 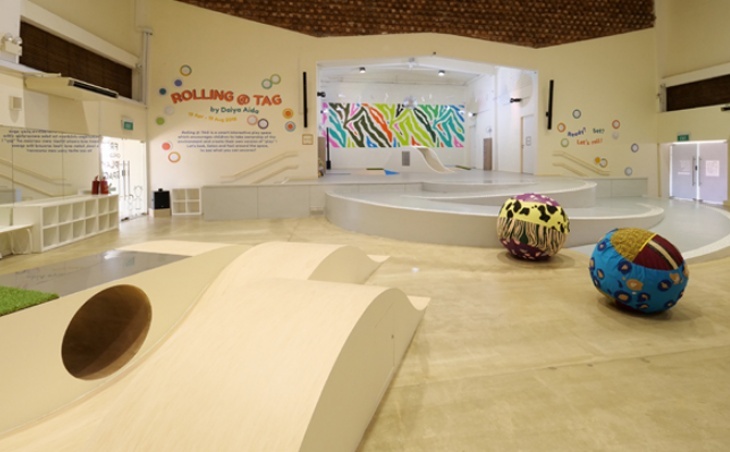 Rolling @ TAG is an interactive children’s play area, which encourages spontaneous play, and aims to cultivate an environment that prompts children to take ownership of the space and feel comfortable to create their own versions of ‘play’. The design of the space does not conform to straight lines, but rather elevates the play experience through slopes, curved surfaces and tunnels. The interactive element is further enhanced through media technology, such as simple electronics that creates sounds and lights when triggered. The unique feature of this space is the fact that there are no rules about how you can or should experience the space. Through exploration, children are encouraged to invent new ways of experiencing the space and to interact with other users of the space. AIDA Daiya (b. 1976, Tokyo) received his MA in Media Culture and Communication from Institute of Advanced Media Arts and Sciences (IAMAS) in 2003. He worked as a Chief Educator of Yamaguchi Center of Arts and Media [YCAM] since 2003 – 2014 and was the head of the media educational program research / development where he produced original workshops for YCAM that deals with media technology and media society. He curated “glitchGROUND” – a YCAM education exhibition (2012), and had conducted media workshops such as “walking around surround” at Spell on You exhibition, Media City Seoul (2012). He is currently working as a research associate for Global Creative Reader program in the University of Tokyo since 2014 and teaches workshop design for graduate students. Alight at Bus Stop (91099) along Mountbatten Road. Alight at Circle Line’s Mountbatten MRT Station and take Exit B.